Adolphe Sax (1814-1894) made two further additions to his musical empire: a concert hall (where in grand style he received the Arab Emir Abd El-Kader in 1865) and a publishing house. For twenty years (from 1858 to 1878, date of the selling of the 2,375 plates to the printer J. Kugelman), the Sax publishing house published basically all of the works composed for the instruments he invented. 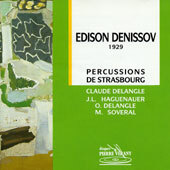 He enjoyed the collaboration of numerous musician friends, almost all of whom taught at the conservatoire, as well as famous instrumentalists of great renown, such as Arban, Klosé, Savari, Singelée, Demersseman and Jonas, who especially composed variations and fantasias for the saxophone with piano accompaniment. We can say that if Franz Liszt was the herald of the Erard house, and that Chopin had and equivalent role, as symbolic as that, at the Pleyel house, Sax was surrounded by a team that assured the active musical promotion of his products by providing a repertoire that was easy, brilliant and very fashionable, capable of captivating audiences and extending the fame of his instruments beyond military circles. Having gained the support of the Minister for War, Sax needed to seduce the fashionable Parisian society. How he achieved this is the focus of the present recording. Does the tango, music so redolent with nostalgia, have a future? Will it ensure itself a place in our musical future thanks to composers of “art” music? And, inversely, will it even be able to enrich the discourse of such composers? By inviting eight Argentinean composers to retrace their roots, Tango Futur seeks to grasp these offshoots, to create encounters, to bring about clashes between music by the contemporary composers of Buenos Aires and traditional tango. Made up of six musicians (saxophone, bandoneon, piano, percussion ensemble, double bass and voice), the instrumental ensemble remains flexible. The programme of Tango Futur was presented for the first time at the “Musica” Festival on the 29th September 1999 in Strasbourg . In constant mutation, the Tango Futur repertoire is incessantly being enriched with new works. 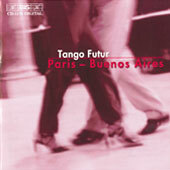 “ Paris – Buenos Aires ”, the title of this CD, represents a new episode in the great love story that has existed between these cities since 1880 when the first tangos were heard. The very young capital of Argentina chose Paris , the “ville lumière”, as a cultural model: architecture (Haussmann), literature (Verlaine, Rimbaud), fashion, entertainment, and so on. Certain etymologists even claim that one of the possible roots of the word “tango” is to be found in the French verb “tanguer” (to pitch – as boats), a movement that is evocative of the dance. The first tango musicians, who arrived in Paris back in 1907 to make recordings, enjoyed instant success. “All” Paris was enthusiastic about the music; the band of the Republican Guard took it into its repertoire; Mistinguett danced a tango at a music hall in 1910; courses in tango multiplied and, in 1912, the columnist Sem wrote that “ Paris has the tango under its skin”. 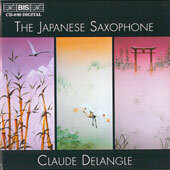 In the world of the saxophone, the French school stands out for its inimitable French touch. 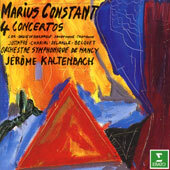 But where does this “French sound” come from, this rounded and sustained sonority coupled with clarity of articulation, that has so inspired composers and provoked the admiration of great conductors? Without any doubt we can seek its origins in the playing of the school’s true founder: Marcel Mule ( 24th June 1901 – 18th December 2001 ). A pioneer on his instrument, Mule seems to have identified the characteristics of a French “classical” aesthetic. Taking his cue from “le beau chant”, his studies of vibrato and of beauty of sound were at the heart of his work. This approach, aiming to trace the timbres back to their original sources, is not dissimilar to that of composers of spectral music, shedding an astonishingly topical light on the work of this creator of the modern saxophone. 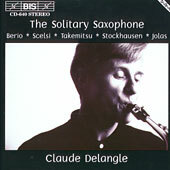 A stirring tribute from Claude Delangle to the “Master” with the repertoire aroused by him. Elisa Hall (1853-1924), the Director of the Orchestral Club of Boston, was a remarkable person in every respect. She was the heart of the city’s musical life and, with the assistance of Georges Longy (a French oboist who emigrated to the USA in 1898), she constituted an amateur orchestra whose programming was of the highest order. In fact, with her commissions, this determined woman not only promoted French music in the USA , but also provided remarkable impulse to enlarging the repertoire of the saxophone, which was still a rather marginal instrument at that time. Thus between 1900 and 1920, no less than twenty-two works were written at her request. She performed them herself, playing the instrument on the advice of her doctor in order to stimulate her hearing which was seriously deficient (sadly she gradually became totally deaf). Although Mrs. Hall’s skill on the instrument seems to have been limited, she was nevertheless a woman of taste if one is to judge by her concert programmes, where one finds the names of Berlioz, Bizet, Chausson, Chabrier, Dukas, Faure, Franck, Massenet, Widor and others. Her open-mindedness leads us to the discovery of pieces by composers as different as Claude Debussy and Vincent d’Indy. 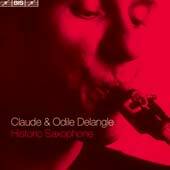 The pieces by Caplet and D’Indy are recorded here with a silver-plated alto saxophone manufactured in the workshop of Adolphe Sax’s son around 1910. It is equipped with a boxwood mouthpiece of the same period; its timbre is of extraordinary softness. The cello, the percussion, the voice and the piano are by turns the partners of the saxophone in a repertoire written between 1970 and 1995. 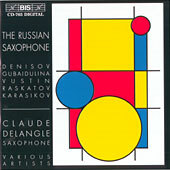 The “mystique” Gubaïdoulina and Voustine mix with those composers close to occidental aesthetics: Denisov (references to jazz), Raskatov (texts by Antonin Artaud), and Karasikov, close to Helmut Lachenmann. Cultural pluralism – a result of the opening up of Japanese attitudes – allows the coexistence of musical genres of various origins and periods: gagaku, shômyô, nô, Western music from medieval times to the present day, jazz, and so on. The selection of works for this recording was motivated by the resurgence of traditional Japanese music in the work of contemporary composers and, in addition, the influence of the Western cultures upon them. “By returning to its original inheritance”, says Akira Tamba, “contemporary Japanese music appears through Western notation to be an innovative synthesis of the present and the past, as well as a unifying link between the Japanese and Western cultures”. What instrument could be better suited than the saxophone, with its variety of forms and cultures, to adapt itself to the expressive devices of the shakuhachi? The two instruments are both capable of irregular and very wide vibrato, fluctuation of notes, weight of timbre, the ability to attack a note from below, glissando, the accelerating repetition of a note, wave-like sound and the production of tone by breathing. Soprano, alto, tenor or baritone, the saxophone appears on its own, as an acrobat with multiple faces. Turned in on itself or letting explode its amazingly extroverted sensitiveness, the instrument reveals the richness of its resources in ten major works of the repertoire. The whole Concerto for Alto Saxophone and Orchestra aims towards the last movement, which consists of variations on the theme of Schubert’s Impromptu in A flat major. For me, Schubert’s music has always been a symbol of music in general and of that which is eternal in art. In the first movement of the Sonata for Alto Saxophone and Piano, the jazz elements are concealed, but they come to the surface in the finale, where a concertante and virtuoso style is predominant. In the “music minus one” style, this CD proposes 20 titles: Rameau, Singelée, Debussy, Ibert, Naulais, Holstein , Rueff, Michat, etc., extracted from the teaching repertoire of Second Cycle students (4 or 5 years of instrumental practice). The teacher and his pupils will find some widely differing styles: from composers who met Louis XIV to those who can still be found in a current directory! 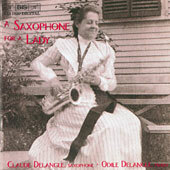 In addition to the saxophone and piano version, Odile Delangle has recorded the accompaniment of most of the pieces so that students can play along with her. 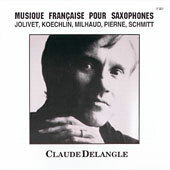 One of the first recordings by Claude Delangle; we can hear him here as leader of the Adolphe Sax quartet, in which he performed at the time with Jean-Paul Fouchécourt, Bruno Totaro and Jacques Baguet. 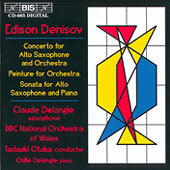 It is a rare occasion to hear him play the quartets by Pierné and Désenclos. 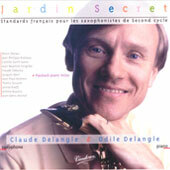 Accompanied by Odile Catelin-Delangle, he records Jolivet and Koechlin with the flutist Pierre-Yves Artaud. It is also his first recording of the Légende by Schmitt and of the Etudes by Charles Koechlin, which have been rerecorded for BIS. 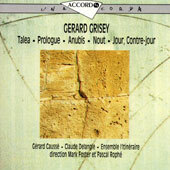 Anubis and Nout for solo bass saxophone, with the Ensemble Itinéraire. This disc has won the “Victoires de la Musique” of the French television.